Is Exfoliation the Secret to Beyonce’s Glowing Skin? Let’s face it, Beyonce is flawless, just like the song says. Her dewy, golden skin is almost as attention-grabbing as her powerful voice. Fans the world over have long marveled at her glistening skin and wished for an equivalent glow of their own. In a recent interview, Sir John said the number one, best-kept secret to Beyonce’s beautiful skin is intense exfoliation. He said that exfoliating twice a week renews skin and brings out the best possible complexion in any skin type. 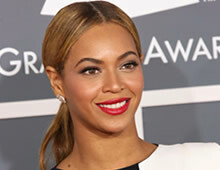 For Beyonce, he uses a fruit enzyme glycolic peel that enhances cell turnover and reveals clear, radiant skin. The exfoliator works so well for Beyonce that Sir John says she rarely even uses foundation! After exfoliation, Beyonce layers on lotion to lock in her skin’s moisture. Sir John said that the type of moisturizer you use makes a difference in how skin appears. Moisturizers with an olive-colored base produce more golden skin than orange-colored moisturizers, for example. When working with Beyonce, Sir John adds bronzer to create a warm, golden glow, and creamy blushes to add natural color. Mascara is his go-to makeup product, as he says it adds polish to any look and is easy to apply in a flash. Makeup can do wonders, but because of Beyonce’s flawless skin, she barely needs it.